“I was part of the first group of ten Latino students actively recruited by SSA in 1968,” remembers Aida Giachello. ”This was a time when Latino issues were not on anyone’s radar screen, and there was little awareness and commitment to help us,” she recalls. A woman, who would later become a good friend, told her that SSA was making ten scholarships available for Latinos and encouraged her to apply. Naturally curious and driven to examine causes of circumstances affecting the lives of Latinos, Ms. Giachello’s journey to America from Puerto Rico was distinctive. “My husband and I came to the United States because I was offered a contract from Northwestern University to continue a research project I had started in Puerto Rico. I was collecting data on social changes in Puerto Rico and surrounding islands, and Northwestern brought me to their Evanston campus to conduct a followup and analysis of the study and data. After I got my bachelor’s degree, I was hired as a researcher in a local psychology clinic doing studies and traveling throughout Puerto Rico and many other islands. Gradually, I developed a program for data collection. Ms. Giachello is an associate professor at the Jane Addams College of Social Work, University of Illinois-Chicago, and founder and director of the UIC-JACSW Midwest Latino Health Research, Training, and Policy Center. 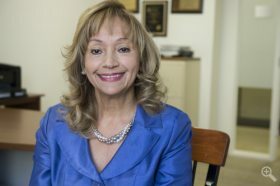 She has a bachelor’s degree in social science from the University of Puerto Rico, a master’s degree from the School of Service Administration (1971), specializing in community work, planning, and social policy, and a doctorate in medical sociology from the University of Chicago (1988), specializing in minority/ Latino health. In January 2014, Ms. Giachello received a University of Chicago Diversity Award for bringing social justice to the Latino community through her contributions to public health research. She continues to research social and racial health disparities, particularly among Hispanics/Latinos and African Americans.